This entry discusses electrical properties of wood that are significant in high-voltage applications and the design of insulation and clearances, bonding, grounding, prevention of structural fires, communications interference, and raptor protection. The following information refers to wood materials, except treated poles. The type of treatment may have varying effects on electrical properties. The designer should refer to Forest Products Laboratory or literature from suppliers for values on specific materials. The electrical conductivity of wood varies slightly with applied voltage and approximately doubles for each temperature increase of 10 °C. 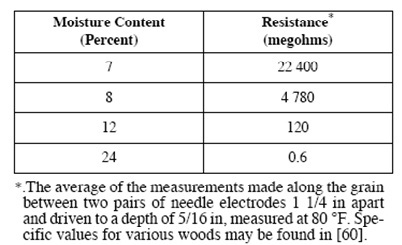 The electrical conductivity of wood or its reciprocal, resistivity, varies greatly with moisture content, especially below the fiber saturation level. The electrical conductivity increases (resistivity decreases) by 10^10 to 10^13 times as moisture content increases from oven dry to the fiber saturation point. Insulation design of a transmission structure is usually preceded by selection of design trip-out rates for outages due to lightning, switching surges, and power-frequency voltages. The decision has usually been made as to which conductor will be used, whether to use overhead ground wire lightning protection, right-of-way restrictions, and whether or not to prepare alternative designs for varying conditions. Wind conditions to accompany the voltage conditions may be selected, because the electrical clearances on suspension structures depend on insulator swing due to wind. Structure insulation may then be coordinated so that flashover of the insulators or air gaps is equally probable. A particularly important design decision is whether or not to bond the insulator hanger at the end of the crossarm to the structure down lead on the pole. This crossarm bonding would provide a metallic shunt to prevent the wood from conducting lightning or leakage current that could cause physical damage. With bonding, insulation and arc quenching properties of the wood will be negated. Without bonding, the wood will be exposed to damage due to lightning or leakage currents, but the wood insulation will improve lightning performance. Operating experience with wood lines in the region of interest is an important consideration in the bonding decision. Bonding may be advisable for tangent dead ends in which the leakage currents of two or more insulator strings will enter the crossarm at a single fitting. The possibility of minor lightning damage (splintering) may be considered in sizing the crossarm. Design with an unbonded wood crossarm should determine the equivalent length of the insulator string that is equal in impulse flashover voltage to the wood and line insulation that is proposed. This equivalent insulator string should be used in a lightning performance estimating procedure, to calculate the outage rate of the proposed design. The calculated performance figure should be compared to known performance of existing wood lines, if available, in an area of similar keraunic level. These methods may also be used to find the clearance needed for impulse insulation from the conductor to a wood brace that has one end bonded to a down lead. Impulse flashover data for rod gaps may be used for conductor-to-pole clearances. Impulse insulation can be improved on many structure types by mounting the down lead on standoff devices rather than directly on the pole. The required insulator and air-gap clearances for these voltages can be determined from data in  and. Data approaching rod-gap tables may be used due to the low electrical mass of a wood structure for switching surge clearances. Unbonded wood members are assumed to have no insulating value and are treated as if they were grounded metal in the process of checking clearances. Phase-to-structure dimensions may be derived from consideration of the following: (1) safety codes; (2) liveline maintenance procedures; (3) midspan conductor motion; or (4) raptor protection.